​1. Deadlift - This is a three-repetition maximum deadlift using a hex bar. ​2. Standing Power Throw - Throw a 10-pound medicine ball as far as possible over the head and to the rear. ​3. Hand-Raised Push-ups - Still have to do pushups, but now you have to add a lift of your hands off the floor when in the down (chest to ground) position each repetition. ​4. A 250-Meter Sprint, Drag and Carry - This is five different tests within one event -- a 50-meter sprint; a backward 50-meter drag of a 90-pound sled; a 50-meter movement; a 50-meter carry of two 40-pound kettle bells; and a final 50-meter sprint. ​5. Leg Tuck - Is a hanging knee up from a pullup bar bringing the knees to the elbows multiple times. ​6. Two-Mile Run - Some things never change. 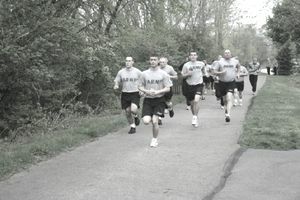 Soldiers still have to run 2 miles for their cardio vascular endurance test. 1 - Standing Long Jump – This is the standard broad jump with no running to build momentum. 2 - Seated Power Throw is a forward throw with both arms while seated using a 4.4 pound (2kg) medicine ball the size of a basketball. 3 - Strength Deadlift is the standard lift of weight (using a hex bar not a barbell) from the floor to a standing position. Start with 120lbs. and build up to 220lbs. 4 – Interval Run (Beep Test) is a short distance interval run designed to assess aerobic capacity. The intervals are only 20m apart and you start each 20m run on the sound of "beeps" that intervals decrease with time. The below section is the current Army Physical Fitness Test and the male standard for ages 27-31. Scoring on the APFT is based on age category, gender, number of repetitions performed of the push-up and sit-up, and run time. The score for each event ranges from 0 to 100 points. Soldiers need to score at least a 60 to pass the test. APFT standards may be tougher for some special purpose units. Scores of 270 or above on the APFT -- with a minimum score of 90 in each event -- earn soldiers the Physical Fitness badge. However, this test has been widely criticized for not adequately measuring strength and endurance. For this reason, in 2011 the Army piloted the Army Physical Readiness Test (APRT) on more than 10,000 soldiers, but eventually decided to stick with the APFT test. While the APFT test is still being used, the following charts show the number of repetitions and scores needed for men ages 27 to 31 to pass the test. Standards vary by age and gender, and the standards have been criticized due to the differences in passing scores for men and women. According to the U.S. Army, the new tests being developed will likely incorporate exercises that soldiers need on the battlefield, that revolve around gender-neutral and standards-based skills. The Occupational Physical Assessment Test (OPAT) is gender-neutral test that includes a standing long jump, a dead lift, an aerobic interval run and a “seated power throw,” which is "a gauge of upper-body strength that represents loading ammunition," according to US Army Times. Scoring for each event has yet to been determined, but unlike the APFT, plans call for one system for all ages and genders.